Pascal de Deyne felt the call for the pastry trade at an early age. The fact of having grown up on a farm where products such as milk, wheat, or beet were part of his day-to-day work probably contributed to this. 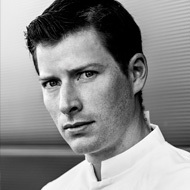 After his training in Bruges, he traveled to distinguished workshops, such as Fauchon in France and De Baure in Brussels, to strengthen his technique and complete his base. His different experiences in elite competitions, with the unforgettable memory of the bronze medal in the Coupe du Monde de Pâtisserie of 2011, also help to shape his personality as a chef. Today he acts as pastry chef at the Van Dender chocolate shop, alongside its owner Herman Van Dender, where he has the opportunity to unleash his creativity everytime the seasons change. With So Good he shares creations with a lot of personality, pronounced volume, and with a nod to one of the themes that motivates him the most, nature. “The choice of flavors should be harmonious and simple, and to show an original work, in this case inspired by nature, a nature to taste”.